Apple’s iPhone 6 is a definite improvement over the iPhone 5, especially when it comes to battery life. Yet, no matter how great something may be, there are always those times that seem to pop up and make one wish for a product that just has a bit more staying power. Normally I can get through an entire day of using my iPhone 6 before the battery strength starts to get seriously low. Having the ability to charge the phone while driving is great, but what happens when I’m at a location where I can’t plug the iPhone in and recharge it? Otterbox Resurgence Power Case to the rescue. The case itself is a little bit larger than the Otterbox Wallet case and just a tad bit heavier but considering that the back of the case contains the 2,600 mAh battery that will recharge your iPhone, it’s totally understandable. The total weight of the case is only 3.05 oz. as compared to Commuter Series Wallet at 2.24 oz. Designed to meet Military rated drop protection, the case provides you with everything that you need. The outer shell is a two-piece fiberglass filled polycarbonate with the inner core composed of high density foam. The case itself is designed for you to insert your iPhone into the case back unit and then once inside, to place the case front unit and snap it into place. 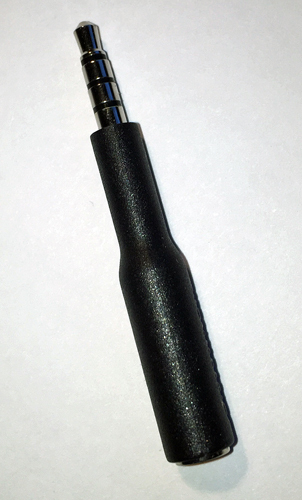 Otterbox does provide the users with an extender as the case does not really allow large or angled headphone jacks to be placed into the headphone jack on the iPhone. The extender is 2 1/8 inches long. To charge the case and your iPhone, you simply plug the micro USB provided cable into the side port on the case and then into your Mac or into the power plug that came with your iPhone and charge up both case and iPhone. You can’t just simply plug in the lightning connector cable that came with your iPhone. There is a LED display on the rear of the case that lets you see as the case is charging the iPhone and the Resurgence case. A quick tap on the display will show you the amount of charge in the case. Press and hold the display button for 1-3 seconds and the Resurgence case will start to charge your iPhone. Once your iPhone has been recharged, the case will stop charging the iPhone. Dependent upon how low your iPhone battery was when you began the charging process, what charge is left in the case will still be there in case you need to provide a bit more charging capability. In my tests, I ran my iPhone down to 18-35% and successfully recharged my iPhone with the LED display reading 1/4 power left. When I ran the iPhone down some more, I got close to 40-50% more of a charge. I wouldn’t want to do that all the time, but it’s nice to know that as of right now, the power is there even after a first charge. 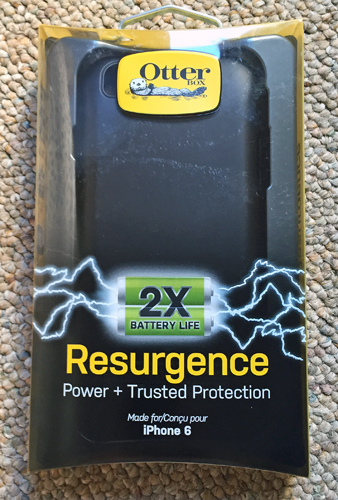 Realistically, the Resurgence Power Case doubles the battery life of your iPhone 6. When you plug in the Resurgence to recharge it, it quickly charges both your iPhone and the case. 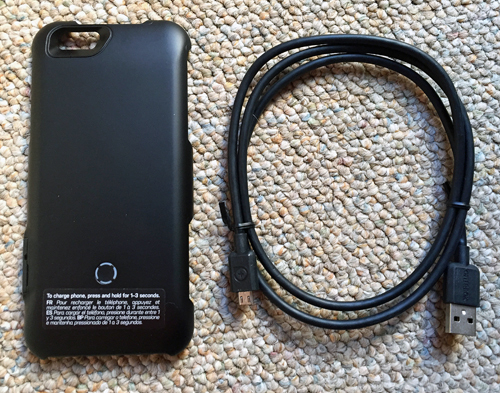 When you go to recharge your iPhone, dependent upon how much power you have already used, the case will recharge it but don’t expect it to just take a few minutes. Steady as she goes would be a good way to describe the recharge. Syncing my iPhone with my Macbook Pro is not a problem, I just utilize the microUSB cable and I’m good to go. Considering the pros and cons, utilizing Otterbox’s Resurgence Power case gives you a two-in-one bargain. You protect your iPhone with a great Otterbox case that is designed to protect your iPhone, plus you get the benefit of being able to recharge your iPhone without having to carry around a separate power bar/source to do so. You get everything you need in the box to get you up and running. There is even a printed fold out instruction sheet to walk you through installing your iPhone in the case, using the case, charging the case and then your iPhone. The Otterbox Resurgence Power Case comes in four different color choices; Black, Glacier, Cardinal and Mint Ice. There will be those who will bemoan the fact that the case is a bit heavier and bigger, but that is the trade off for what you get in return. If you want the ability to protect your iPhone and still be able to recharge it when needed without having to lug around an additional accessory, seriously consider Otterbox’s Resurgence Power Case. 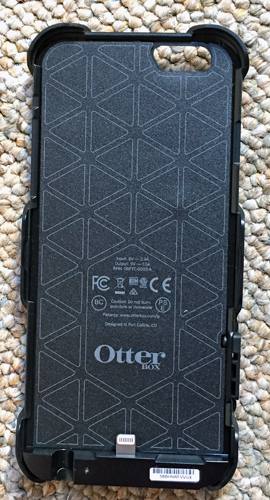 All in all, I give the Otterbox Resurgence Power Case for the iPhone 6 a My Mac rating of 9 out of a possible 10.